One Momma Saving Money: Stride Rite has select sneakers marked down to $24.99! 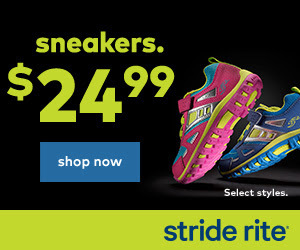 Stride Rite has select sneakers marked down to $24.99! Shop Select Sneakers Starting at $24.99 For A Limited Time! Valid 3/4-3/15. There are even a number of shoes under $24.95 on sale!! !